Danielle already had the concept in mind. 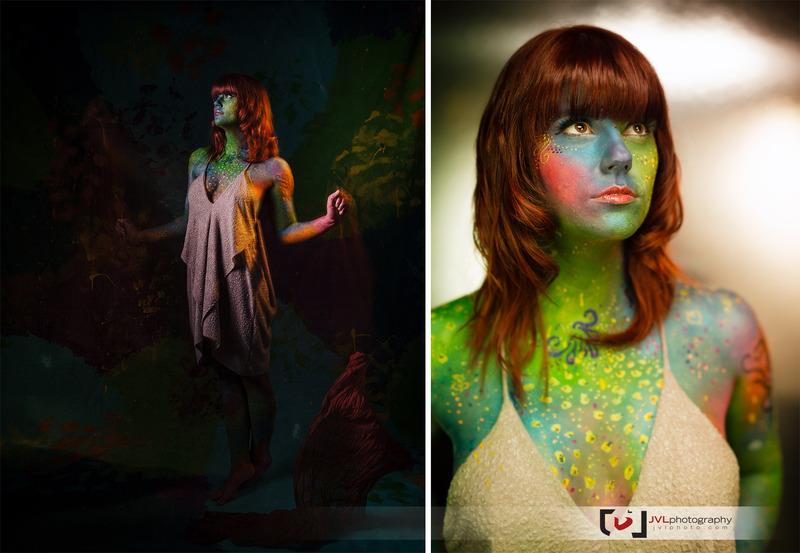 The title, Chameleon, was to be translated to her in the form of body art and we’d photograph her as the “chameleon”. In pre-production we realized that a unique backdrop would be required, which Danielle dutifully painted in her living room over the holidays. It would provide a sort of forest “bokeh” when photographed from a distance and, when used in a full-body portrait. it would help her blend into her surroundings keeping the colour palette consistent while providing a texture you don’t get from seamless paper backdrops. We worked out of a local (to me) Hintonburg studio, House of Common. 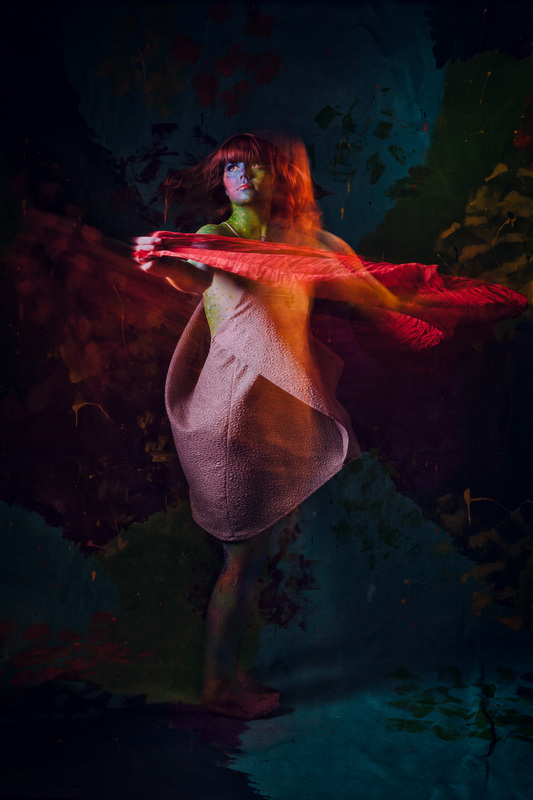 which afforded us the space and privacy to spend hours on body painting and makeup as well as tweaking the lighting setup for multiple shots. The great thing is, once everything’s set up and done, the shoot itself goes relatively quickly. It’s the pre-production and “getting it right” that took a lot of time. These images will be Danielle’s brand for the foreseeable future. Sure, she isn’t going out in full face paint for any live performances but albums, posters, websites, social media profile images, and any other promotional material related to the release and sale of Chameleon will be seen with at least one of these images on it. The time spent on pre-production and setup was important to accomplish a consistent and clean look within the time (and budget) we had to work with. I also wanted to play on the idea of a chameleon’s ability to blend its colour into the surroundings. We finished our day using Elinchrom’s new delay feature on the ELC Pro HD 1000. We set the camera for a longer exposure and used the built-in modelling lamp to light Danielle as she moved in the scene. A flash “pop” was set on a delay just as the camera finished its exposure providing a frozen moment combined with the motion leading up to it. That last image was just a fairly simple portrait taken at a shallow depth of field with Sigma’s new 50mm ƒ/1.4 ART which I recently reviewed over on CanonRumors and a Westcott RapidBox Duo… though it was so dark I needed someone to hold a small flashlight on Danielle’s eyes to be able to focus. We also made a timelapse of most of the process, which you can see over on Danielle’s YouTube channel. Look for the album to drop May 2015. Posted on Tuesday, January 27th, 2015 at 10:13 am. 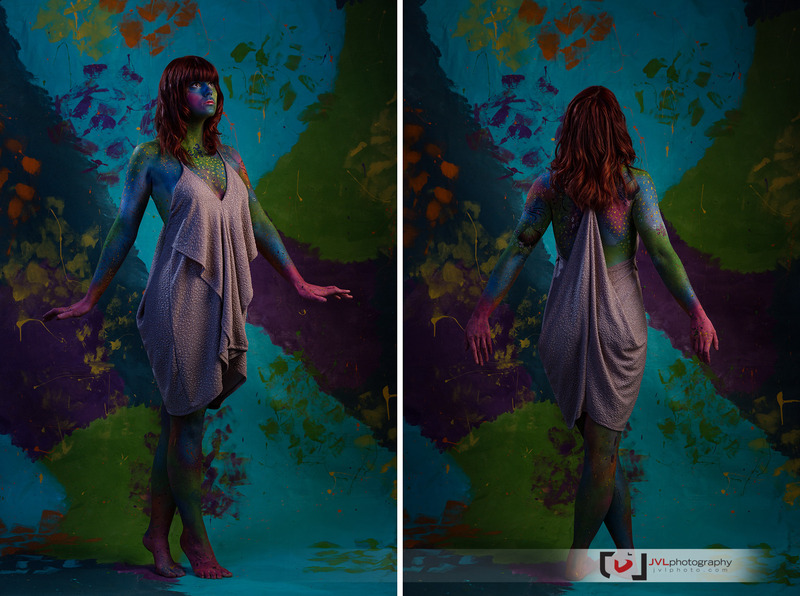 Filed under: Commercial, Portraits Tags: Body Painting, Commerical Photographer, Danielle Allard, Hintonburg, House of Common, Justin Van Leeuwen, JVLphoto, Metamorfaces, Musician, Ottawa, Portrait Photographer, Portrait photography, studio	RSS 2.0 feed.